Location: renovated Interhotel Sandanski is located in a beautiful park, very close to the town's center, it is one of the country's largest balneotherapy centers. Accommodation: 263 double rooms, 8 small suites and 3 deluxe suites, with view to the town or park. All rooms are equipped with modern furniture, sat-TV, special flooring, WC/bath, A/C, telephone, mini-bar, hair-drier, safe, WiFi internet, balcony. In the hotel: main restaurant with terrace, "Mehana Bulgare" folklore restaurant, Mediterranean restaurant, lobby bar, snack bar "Chekpoint", bridge club, safety deposit boxes at the reception, shopping arcade, beauty salon, hairdresser, children play room, 3 conference halls (40-100 seats), Internet Center, bank office, laundry. Also - indoor and outdoor swimming pools with mineral water and automatic temperature control, children swimming pool, sauna, tennis court, gym, fitness, two-lane skittle-alley, safe. Choose between a great variety of herbal, aroma and mineral salt baths; massages with essential oils, honey or luxury chocolate massages as well as body-shaping, exfoliating and revitalizing procedures such as algae, shea and wine therapies. 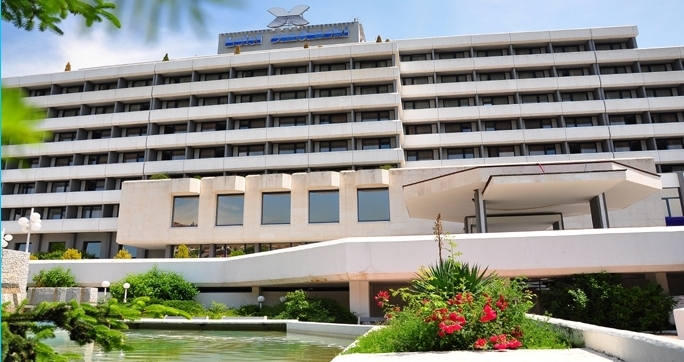 Interhotel Sandanski's balneology complex has traditionally been recognized by a number of physicians as a preferred center for prevention and treatment of osteoporosis and locomotory system disorders such as arthritis and arthrosis. The Paraffin procedures have an extraordinary effect on osteoporosis recovery. All procedures are prescribed by our doctor during an initial examination and they include local paraffin application on painful spot. The TORFOSOL is an outstanding component used in our curative and preventive programs. Torfosol is a unique BIO product patent in Bulgaria. It consists of dried and ground turf, fertilized with Fluorine /F/, Silicon /Si/ and Magnesium /Mg/. Torfosol is often prescribed for treatment of locomotory system conditions. It is applied either as a supplement for mineral baths or as partial application on algetic zones. Physical therapy and electro therapy such as ultrasound, laser therapy, magnet therapy and electrophoresis are widely used in the treatment of various diseases at Interhotel Sandanski's Balneology center.